I knew I wanted to use a return address stamp for my save the dates and wedding invitations from the second I found out that it was a thing (via pinterest, of course). You get a uniform, pretty, return address on everything-and it looks so much nicer than a label (in my opinion). And it's inexpensive-you just pay a one time cost for the stamp (and the ink--or you can just buy a self inking stamp!) and that's all you need! 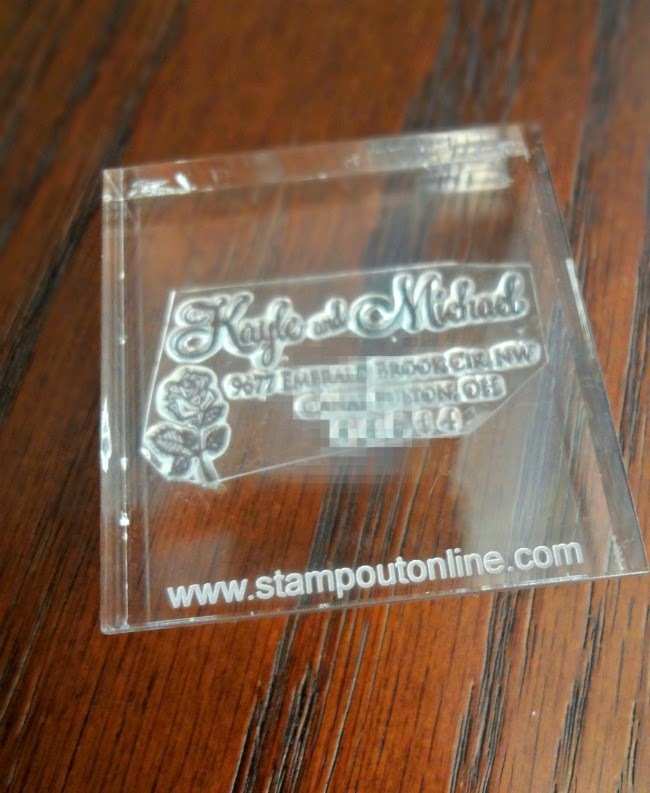 So I was beyond excited when, on my hunt for the perfect return address stamp, I connected with StampOutOnline and they agreed to work with me to design a custom stamp and a review for the blog! 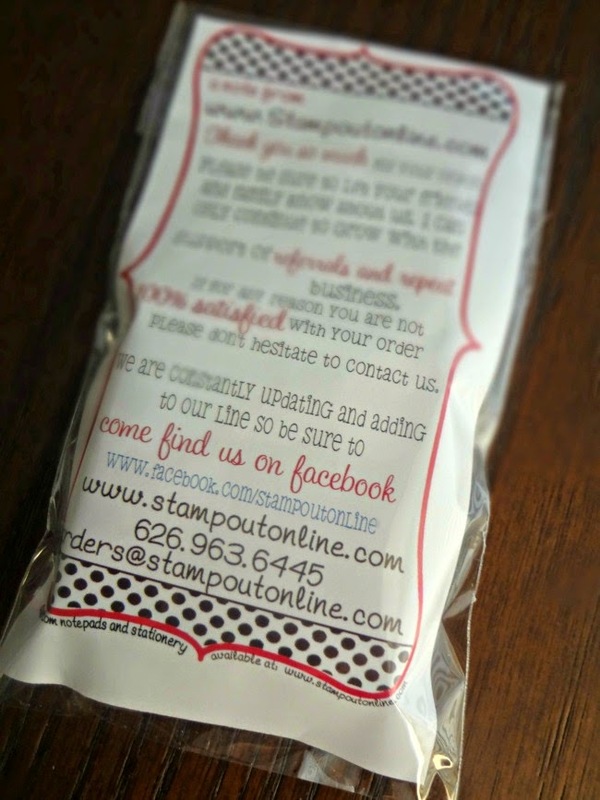 The process is simple: you simply visit StampOutOnline's website or etsy shop. You then contact them (either message them on etsy or email them) if you want a fully customized stamp or just order based off of one of the designs they already have. You give them the names and addresses and particulars for the stamps as well (they do make plenty of stamps other than return address ones, but since that's what I went with that is what we'll discuss!) In my case, I loved the overall look of this stamp's layout (fonts, etc.) but I wanted to make sure the dimensions would work for my Save the Date's (I wanted to make sure it would be small enough to fit in the upper left hand corner)--I also wanted to see if a rose could be incorporated (since that's a bit of a theme for the wedding). They got back to me crazy quickly with 4 proof options they'd come up with! Then all I had to do was pick my favorite (or I could have tweaked it with anything else I would've want changed)/approve it and my custom stamp was on its way to me! My stamp arrived in super duper pretty packaging and the stamp inside was even more gorgeous! 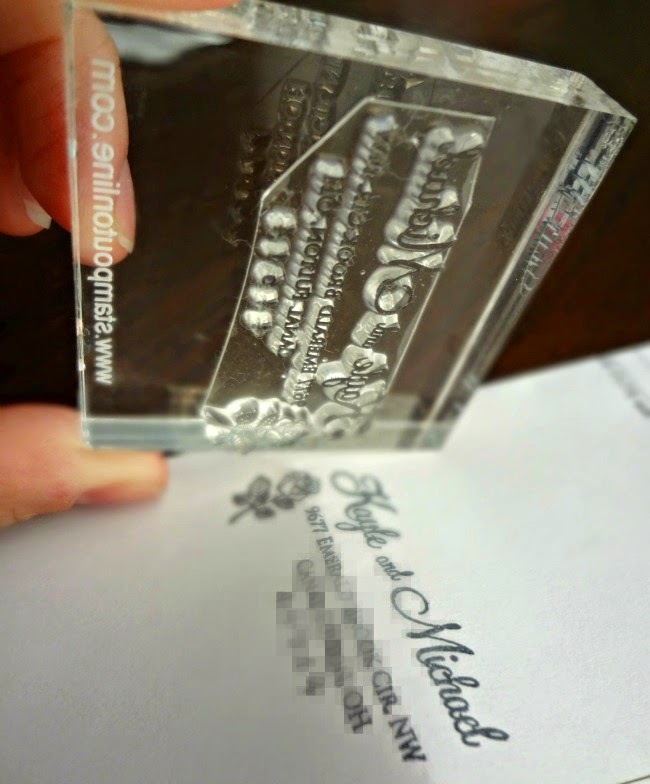 It was made of all-clear glass that I could then just press, stamp-side down, into my ink pad and then onto where I wanted the stamp to go! First and foremost stamp a few times on a scrap piece of paper to get the feel of the stamp before you stamp your invitations or envelopes. 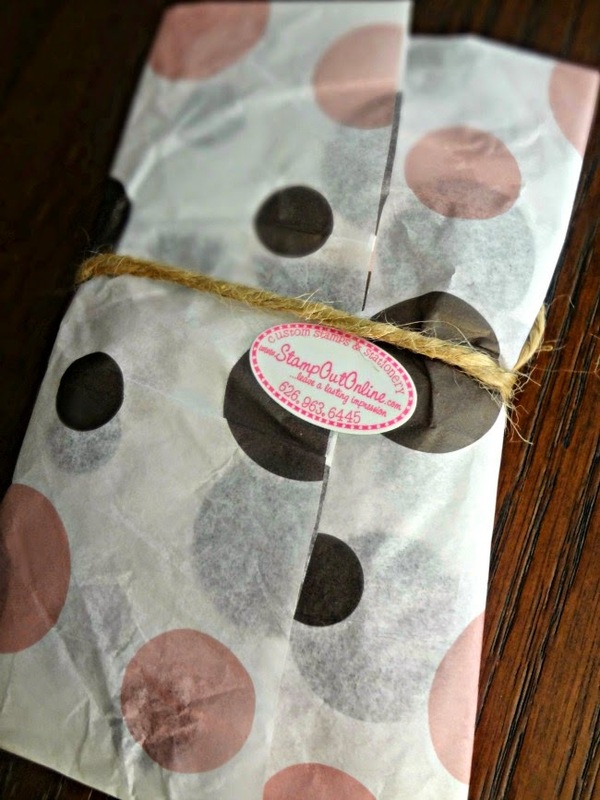 If you are stamping envelopes, stamp them BEFORE you stuff them so the stamp goes on perfectly. They also recommend standing up when you are stamping and, maybe, stamping on a surface that is at your waist height-like a dining room table or a desk, to give you some more leverage while stamping and so you can use more of your weight. Make sure that your stamp is completely and evenly covered by ink. And if you have any problems at all they are crazy helpful and will talk you through it if you ask them for help! They always test out stamps before they ship them, though, so every stamp should have the ability to work flawlessy! What do you think-isn't our stamp pretty? It would be prettier if I hadn't pixelated the address in a photo editor, but I figured I should probably do that for safety. 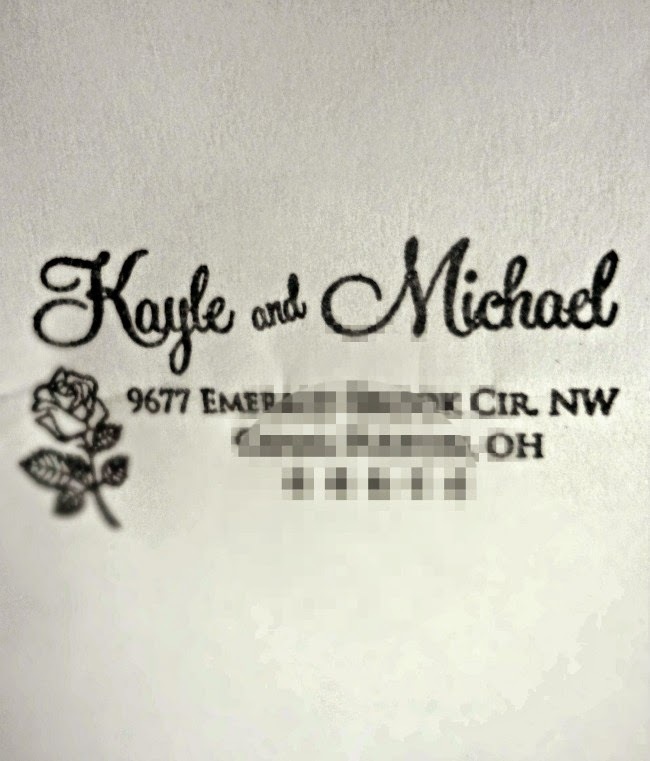 We used my mom's address for the stamp, as she works at home and has more space to handle any gifts and RSVP's when they come in. Disclaimer-I was provided with a complimentary stamp from StampOutOnline. I was under no obligation to review and received no further compensation. All opinions are, as always, my own.